Big difference between the death of a moniker called #offshore #outsourcing and the actual demise or decline in the use of remote or low cost locations. The moniker was long past its life expectancy and kept alive more by analysts and media than by buyers and vendors. ‘The reality is technology has become core to business competitiveness today’. True and while cost will continue to remain a key driver, technology is creating more avenues for innovation than ever before. Offshoring is dead ... Welcome BOTshoring. Offshore companies don't have the DNA to pivot, let's see... interesting times Phil. Great insights. 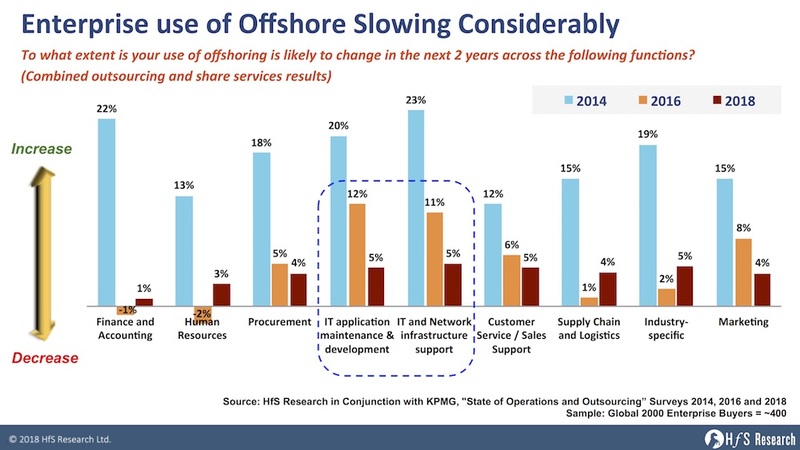 A few questions though: Does this mean offshore services are moving onshore? Or, is the size of offshore business shrinking because of automation and digital transformation initiatives; impacting services and offerings which are the first ones to get automated? Trump's policies may have accelerated such initiatives than influencing companies to move their offshore activities onshore. My view is offshore businesses are evaporating(due to automation) or moving onshore as due to automation cost arbitrage is reducing. Cost is always one of the prime factor for any buyer, be it product or services. But some service providers have been reinventing themselves to be relevant and futuristic in a competitive market to cater to buyers of varied needs. While Trump's policies are a warning bell for offshorers, it's also a forced conversion of offshoring buyers to become value buyers. As I recall, past surveys showed that providers fail to meet expectations regarding innovation and applying new technologies. 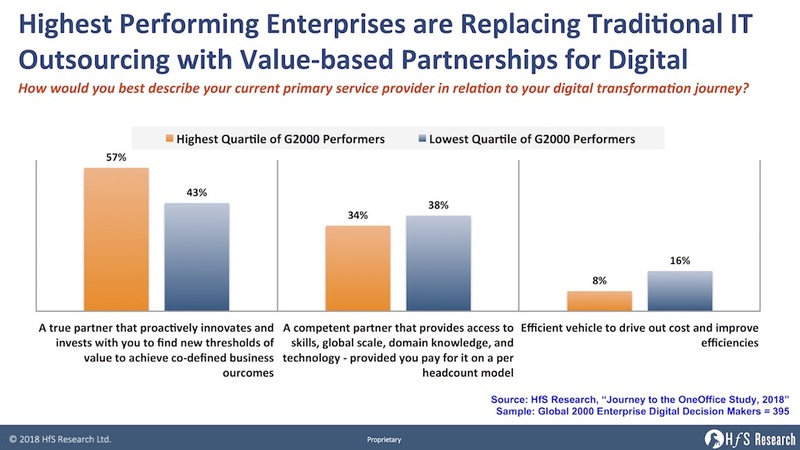 So, while this new data shows a positive trend, one that has been predicted for a few years now, it is up to the providers to “show us the money” so to speak and demonstrate that they can apply automation on cloud platforms that underpin strategic initiatives. I am looking forward to this next wave. It should be good for everyone. When having been involved in back office BPO more than 15 years ago, it already was an obvious learning that wherever possible, tasks should be automated by clever technological solutions. Offshoring any tasks to a low-cost location was second choice. For me, this was a step towards an industrialisation (= automation and preferably standardisation right away) which was a first move towards digitalisation in the back office. As the article rightly explains, new service models, cloud based offerings are major drivers in IT. In the specific case of outsourcing of application development and maintenance I see lots of formerly manual tasks or consultancy replaced by tools or platforms. This is where we try to focus on as a small niche player with our SaaS tools (https://www.plixos.com/en). Still, classical offshoring of application development is remaining at a certain level. We have just finished two offshoring initiatives, one by a German customer as well as one from the US. In both cases, main driver was scaling up the development team with a focus on high quality by keeping the costs. In simple words both were looking for “an option to ramp up at good quality for the money”. Worth to mention, the German customer as well as the one from the US selected Eastern Europe as their preference. In sum, your statement “How can I get quality services delivered at competitive prices that take advantage of the cloud, automation, and global talent." is right to the point. The India GSI model was never based on investment, transformation but on cost mgmt. Now that the Global 5000 need dynamic partners to complete with the Tech 10k they need partners who are "real" experts have true references & quals in their focused book of business. India GSI's investment "void" of the last 10 years is so large, they can never overcome it. Having worked 15 years for one of the top 3 Indian GSI's and trying to spend 5 years as a sub-BU head trying to transition talent, processes, solutions, client line of business services, etc.. There is not the ability to cull the legacy businesses, processes, models, etc..
Where is the vision, strategy, investment, model changes. The Indian GSI's investment is 5x less then US GSI's (SG&A/Talent/Training/invest deals for quals) Huge stock buy-backs, BAU Ops driven models, Selling more to IT or Corp backoffice is all there is. The US GSI's are getting hammered by "new model" SI's who are small and selling directly to the LOB's. The new SI's which are spending 25-35% of revenues on investments in people, process, tech etc.. while offering real Line of Business solutions. The concept of customer & service provider is becoming blur. Change in inevitable. And the is change is for betterment. In the conventional offshoring model, the customer was taking interest in and responsibility for the quantum and nature of work to be done at the low cost location. Returns were mainly measured through cost saving. The customer will still expect the cost of the outcome to be optimum. Pricing pressures will continue to be there. The provider or partner will have to take the responsibility of deciding how much work can be done at the lower cost location while ensuring that quality and on time delivery is achieved. This will encourage the providers to enhance the skill and capability of the offshore teams, to remain competitive. The teams interfacing with the customers will also have to be strengthened to take over the role that customers will transition to the providers.